Here are the newest changes and additions to the website. As the site is growing all the time, you can learn about what is new by checking this page. To make it even more convenient, you can have this same information sent to you as a blog. Just use the orange "RSS" button in the "Subscribe to this site" box in the left-hand column get started! If you don't know how this all works, just click on the question mark in the "Subscribe to this site" box to get more information. An even more convenient way to get the news fast is to subscribe to What's New at Seed Bead Smarts by email here. Continue reading "Laura Fisher's Spiral Rope"
Continue reading "Perfect Daylight by Electricity"
Continue reading "Keeping Beads Separated on the Table"
Bead Societies are great places to learn, to connect with others, to see lots of great beadwork, and to build lifelong friendships. Bead Journal 2011 by Virginia Brubaker, part of the Bead Journal Project. 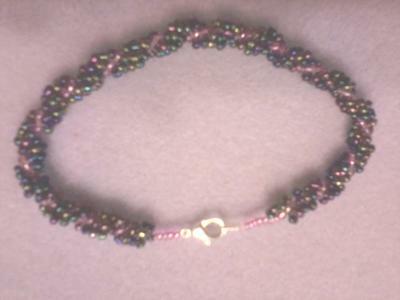 Continue reading "Bead Journal 2011"
Here are free bead projects to enjoy. You can combine these with material in the Techniques section and with what you learn in the Bead Art area of the site to create your own unique works. Continue reading "Free Bead Projects"
A beaded cabochon makes an effective brooch. And in the case of these beaded cabochon brooches, there is plenty of sparkle to go around. Continue reading "Six Beaded Cabochon Brooches"
You can make a bead painting by transforming a photo into your own piece of bead art. Here is a complete demonstration of taking a photograph and turning it into a piece of bead embroidered art. Continue reading "Bead Painting from a Photograph"
Color Works, the Crafter's Guide to Color, by Deb Menz knocked my socks off. I love the clear prose and the wonderful samples in 9 craft media. Continue reading "Color Works, the Crafter's Guide to Color, Book Review"
Continue reading "The Beader's Guide to Color by Margie Deeb -- Book Review"
Continue reading "The Beaders Color Palette by Margie Deeb -- A Book Review"
What books belong on the beading book shelf? There are some books that should be on everyone's bookshelf, and others that you may not need. We'll help you sort it out. Continue reading "The Beading Book Shelf"
Beaded jewelry business advice and encouragement. If you want to start selling your beadwork, check this out. Continue reading "Starting a Beaded Jewelry Business"
If you would like to run a bead challenge for your group or for your bead store, here are detailed examples of the process and procedures to make it easy. Continue reading "A Bead Challenge: How to Run Your Own Bead Challenge"
Tips on magnifiers for beading, from simple glasses to lighted magnifiers with great optical lenses, with tips on buying one you will like. Continue reading "Tips on Magnifiers for Beading"